Campania is a captivating and beautiful region in the southwest of the country. It’s also home to two of the most dangerous volcanoes in the world: Mount Vesuvius and Campi Flegrei, situated on either side of Naples. Mount Vesuvius, to the east of Naples, last erupted in 1944 but is better known for burying Pompeii under up to 20 feet of volcanic ash and pumice in 79 A.D. Vesuvius’s violent eruptions are also responsible for the volcanic soils found in the growing zones of Irpinia, about 30 miles away. Irpinia is home to native red grape Aglianico, most notable in Taurasi, and white grapes Fiano and Greco di Tufo. While these varieties grow in other areas, they produce savory wines of exceptional longevity here. Fiano di Avellino produces full-bodied white wines, with floral aromas, rich fruit flavors and smoky mineral sensations. The best have great intensity and complexity. Unlike Campania’s other native white grapes, Fiano has spread to additional regions, where it yields rounder wines with more tropical fruit sensations. Still, hilly Irpinia is the grape’s spiritual home. “Fiano excels here, thanks to high rainfall, dramatic day and night temperature swings and the soil: volcanic soils and clay deposits,” says Pierpaolo Sirch, agronomic and cellar operations supervisor at Feudi di San Gregorio. Greco di Tufo, named after the tiny town of Tufo in the province of Avellino, stands alongside Fiano as one of Southern Italy’s most noble white grapes. A clone of Greco Bianco, Greco di Tufo thrives in its namesake denomination due to its cool climate, frequent rainfall and volcanic soils. The wines have crisp acidity, flinty minerality and intense aromas and flavors that include peach and citrus. They’re chock-full of complexity and finesse. Campania’s flagship red wine, Taurasi, also hails from the hills around Avellino. Often called the “Barolo of the South,” Taurasi wines are typically full-bodied and full of flavors that evoke red cherry, dark spice, menthol and mineral sensations, all set in a powerful, ageworthy structure. Lonardo’s vines, which range from anywhere between 20 to 100 years old, generate a natural concentration of flavors, and they have a number of pre-phylloxera, ungrafted vines. Composed of a network of craters and other still-active volcanic structures that are largely submerged in the Bay of Naples, Campi Flegrei lies just west of Naples. Volcanic activity is a way of life here, where the smell of sulfur permeates the air and residents are used to the feel of frequent seismic activity. It’s home to intriguing wines made with ungrafted native grapes like Falanghina. There are two distinct clones of Falanghina: Falanghina Beneventana, used in Falanghina del Sannio, and Falanghina Flegrea, grown in Campi Flegrei. While Sannio produces more structured wines, Campi Flegrei’s offerings are linear and lighter in body. They exhibit floral aromas and notable saline minerality, thanks to sandy, volcanic soils and vicinity to the sea. The family’s vines are, on average, 60–85 years old, though some extend back 200 years. “Because of the sand, phylloxera didn’t get here, so our vines are ungrafted,” says Di Meo. “The roots go deep down, producing grapes rich in potassium and salt. Contrade di Taurasi –­Cantine Lonardo 2011 Vigne d’Alto (Taurasi); $80, 94 points. Truffle, new leather, ripe plum, tilled soil and chopped herb are some of the aromas you’ll find on this impressive red. Polished and powerfully structured, the palate delivers morello cherry, ripe blackberry, star anise and clove set against a backbone of tightly knit, velvety tannins that lend firm support and a smooth texture. Drink 2021–2031. Oliver McCrum Wines. Mastroberardino 2009 Naturalis Historia (Tau­rasi); $90, 93 points. Aromas evoking dark baking spice, forest floor, French oak, dried herb, violet and balsamic menthol are some of the aromas you’ll find on this fragrant structured red. The concentrated palate evokes plum, blackberry jam, vanilla and tobacco while firm fine-grained tannins provide the support. Drink 2019–2029. Drink 2019–2029. Leonardo LoCascio Selections–Winebow. Feudi di San Gregorio 2016 Fiano di Avellino; $21, 91 points. Bosc pear, yellow apple and honey scents follow through to the radiant, medium-­bodied palate, along with nectarine and Mediterranean herb notes. An energizing mineral tone adds depth. Terlato Wines International. Cantine di Marzo 2015 Franciscus (Greco di Tufo); $27, 91 points.Pressed yellow flower, flint and Mediterranean herb aromas fuse with citrus zest and a balsamic note. The round, savory palate doles out ripe apricot, creamy pear and juicy nectarine flavors, tangy acidity carrying a bitter almond tone long into the finish. Conexport Italy. La Sibilla 2015 Falanghina (Campi Flegrei); $20, 89 points. This wine’s delicate nose offers white spring flower, Mediterranean herb and wet stone aromas. They carry over to the fresh palate, along with fruity green apple and pineapple notes while a savory mineral note backs up the finish. Oliver McCrum Wines. The volcanic activity that forged the area ended millions of years ago, but Soave, named for the picture-perfect medieval town at the center of production, still offers a great example of wines made from its soils. Only parts of the Soave denomination claim this volcanic makeup, however, namely select slopes in Soave and Soave Classico (the original growing zone). There, steep hillside vineyards have dark-colored soils consisting of basalt and tuffaceous rocks. The grape-growing areas on the plains consist of silty clay or limestone soils. Soave’s hills demonstrate how soils influence the area’s flagship grapes, Garganega and Trebbiano di Soave, and their wines. Generally speaking, Soaves that originate in volcanic soils are more vibrant, precise and full of finesse. 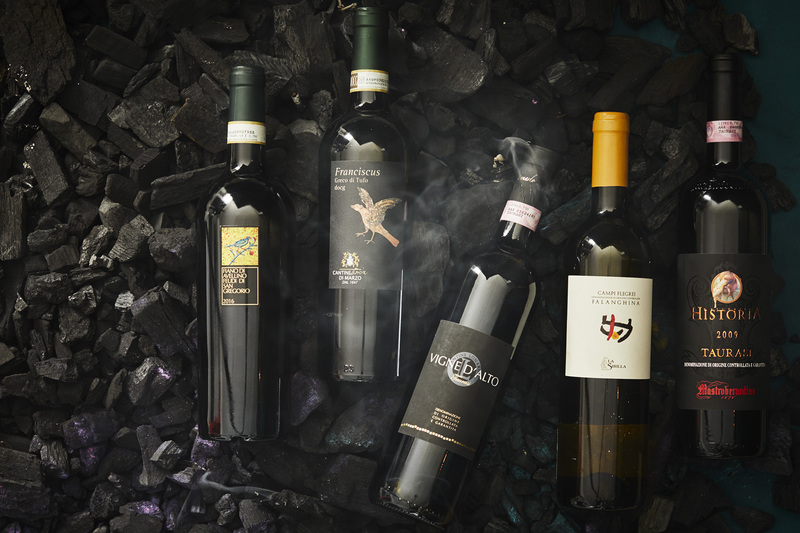 “The combination of volcanic soils and native grapes Garganega and Trebbiano di Soave generates elegant wines, loaded with freshness, mineral and floral sensations,” says producer Andrea Pieropan, of the historic Pieropan family winery. Its stunning, single-vineyard Calvarino Soave Classico is made from 70% Garganega and 30% Trebbiano grown in volcanic soils. Pieropan also makes another single-­vineyard Soave Classico, La Rocca, entirely from Garganega grown in chalky clay soils. La Rocca is more structured and fruit-driven than Calvarino, but similarly compelling. Vertical tastings show that both wines boast remarkable longevity. The Lessini Durello denomination, home to vibrant, mineral-driven metodo classico sparkling wines, is another testament to the area’s volcanic terroir. Overlapping the Soave denomination to the east of the Classico area and spreading into the Vicenza province, the growing zone comprises high hills of purely volcanic origin. Monte Calvarina, an ancient volcanic cone near the town of Roncà, is the historic growing area for native grape Durella. “Durella, a unique indigenous variety, grows only in this area, because it needs infertile, volcanic soil, high altitude and southern exposure,” says Antonio Fattori, owner and enologist of the Fattori winery. Pieropan 2015 Calvarino (Soave Classico); $31, 96 points. Always one of Italy’s premier white wines, Pieropan’s gorgeous 2015 Calvarino sets a new benchmark. Opening with heady aromas of white spring wildflower, citrus blossom, aromatic herb and crushed rock, the savory palate delivers layers of lemon drop, ripe apple, juicy pear and tangy mineral notes. It’s concentrated yet elegant and thoroughly delicious. Drink through 2025. LUX Wines. Cellar Selection. Prà 2015 Staforte (Soave Classico); $25, 92 points. Creamy, fresh and crisp, this opens with aromas of dried wildflower and ripe orchard fruit. The rounded palate delivers pastry dough, white peach and yellow apple with fresh acidity. A lemon drop closes the lingering finish. T. Edward Wines Ltd. Editors’ Choice. Fattori 2011 Roncà 60 Non Dosato Metodo Classico (Lessini Durello); $50, 92 points. Bread crust, dried fruit, crushed herb and acacia aromas carry over to the enveloping, savory palate along with creamy yellow peach, nectarine zest and a hint of toasted almond. Vibrant acidity and an elegant perlage provide energy and finesse. A honeyed nut note and a touch of salt wrap up the dry, lingering finish. The Wine Company. In the Alpine foothills of northern Piedmont, Alto Piemonte is one of the most fascinating areas in Italy. Home to noble grape Nebbiolo as well as native grapes Vespolina, Croatina and Uva Rara, the area produces vibrant, fragrant and structured reds known for elegance and longevity. Alto Piemonte’s five main denominations—Lessona, Gattinara, Ghemme, Boca and Bramaterra—have higher vineyard altitudes and cooler temperatures than their more famous southern neighbors, Barolo and Barbaresco. But it’s the soils that are unique. Lessona has bright yellow, mineral-rich soil of marine origin, while Boca, Gattinara and Bramaterra have different proportions of porphyritic soils deposited by the eruptions from an ancient, long-extinct supervolcano. Dinoia says that the winery’s vineyards in the Coste della Sesia denomination (which includes Lessona and Gattinara) have a mix of marine sands, clay and gravel. Soils in Boca, on the other hand, are entirely volcanic. Gattinara also has iron-rich porphyry, while parts of Bramaterra share Lessona’s yellow sand. Other parts are dominated by volcanic rock. Marco Rizzetti, managing partner and the 11th generation to run storied Tenute Sella, says there’s a difference between its wines from Lessona and those from the rocky vineyards of Bramaterra. “Lessona is like a classy, elegant signora, while Bramaterra is masculine, like a rugged mountaineer,” he says. Le Piane 2009 Boca; $55, 95 points. Combining finesse and structure, this impressive wine opens with fantastic scents of new leather, woodland berry, baking spice and balsamic notes. A blend of Nebbiolo and 15% Vespolina, the enticing palate doles out juicy black cherry, raspberry and white pepper framed in firm refined tannins. An energizing mineral note carries the lingering finish. Despite the warm vintage, it still boasts freshness. Drink through 2026. Artisan Wines, Inc. Editors’ Choice. Travaglini 2011 Riserva (Gattinara); $60, 93 points. Attractive aromas of rose, wild berry and aromatic herb lead the nose on this elegantly structured red. The bright palate offers crushed raspberry, juicy dark cherry, licorice and clove alongside firm polished tannins. A flinty mineral note energizes the finish. Hold for more complexity. Drink 2019–2026.Palm Bay International. Tenute Sella 2011 Bramaterra; $32, 90 points. Made with 70% Nebbiolo, 20% Croatina and 10% Vespolina, this has enticing scents of rose, pressed violet, wild berry and a hint of menthol. The bright, silky palate delivers juicy red cherry, crushed raspberry and white pepper alongside polished tannins. Drink through 2021. de Grazia Imports LLC. Perched on a high volcanic bluff in southwestern Umbria, Orvieto is one of the most beautiful ancient Italian cities. It’s also the name of one of the country’s most famous white wines, Orvieto, a denomination that overlaps from Umbria into Lazio. The town’s history stretches back to the Etruscans, who dug deep caves and a labyrinth of long tunnels in the tuffaceous rock beneath the town. Orvieto’s unique growing zone was formed from the former volcanic complex of the Vulsini Mountains during the Pleistocene epoch, most notably because of the volcano that created nearby Bolsena Lake. Fallout from massive volcanic eruptions once covered the entire region, but over the course of millennia, only select parts of the growing area now have volcanic soils. Orvieto’s array of soils includes tuffaceous zones of volcanic origin to the south, clay in the center, sandy with marine fossils in the northeast and silty alluvial soil along the Paglia River. Farther north, Giovanni Dubini, co-owner of Palazzone, has mostly sedimentary clay soil of marine origin, though the highest point of one of his vineyards is interspersed with tuffaceous soil. Orvieto, Orvieto Classico (the original growing area) and Orvieto Superiore (more structured) must be made from a minimum of 60% Procanico and Grechetto. There are several types, which range from dry (secco) to sweet (dolce) as well as a Muffa Nobile (noble rot, or botrytized) version. Palazzone 2015 Campo del Guardiano (Orvieto Classico Superiore); $24, 93 points. Complex and structured, this opens with intense aromas of ripe orchard fruit, tropical fruit, aromatic herb and a light balsamic note. The round, full-bodied palate delivers ripe yellow apple, yellow peach, almond and a honeyed mineral note. Fresh acidity brightens the creamy flavors. Truly delicious. Drink through 2023. Multiple U.S. importers. Editors’ Choice. Marchesi Antinori 2016 Castello della Sala San Giovanni della Sala (Orvieto Classico); $25, 93 points. Heady aromas of honeysuckle and yellow stone fruit leap out of the glass. A blend of Grechetto (a small percentage of which is grown in volcanic soils), Procanico, Pinot Bianco and Viognier, the juicy, delicious palate delivers peach, apricot, orange zest and a hint of pineapple. It’s savory and balanced, with tangy acidity. Ste. Michelle Wine Estates. Sergio Mottura 2016 Tragugnano (Orvieto); $20, 90 points. A blend of organically farmed Procanico, Verdello, Grechetto and Rupeccio, this opens with aromas of acacia flower, orchard fruit, flint and a hint of thyme. The structured, savory palate delivers Williams pear, lemon zest and a touch of mint alongside fresh acidity. A pleasant minerality signals the close. Chambers & Chambers. No mention of volcanic wine regions would be complete without Mount Etna. The tallest active volcano in Europe, Mount Etna’s pristine wines should put to rest any debate that perceptible minerality is a myth. Made primarily with Nerello Mascalese, Etna’s reds boast the finesse of top Burgundy and the complexity of Barolo, while the whites, made predominantly from Carricante, boast unfettered purity and radiance. Located in northeastern Sicily, Mount Etna benefits from double the rainfall and cooler temperatures than the rest of the island, as well as intense sunlight. Etna has the highest vineyard elevations in Sicily, some of the highest in all of Italy, growing at 1,300 to more than 3,900 feet above sea level. This elevation generates marked day and night temperature changes. These unusual growing conditions play an important role, but the driving force behind Etna’s wines is its volcanic soils, which range from basalt pebbles and pumice to black ash. Etna’s contrade (the local name for crus or single vineyards) are delineated by the volcano’s lava flows, and each one of these distinct crus translates into the wines. Most producers were drawn to Etna for its sleek, fragrant reds, but for Planeta, who has also planted a small amount of Riesling, it was the whites. “I love their crystalline character that combines fruit and flinty mineral notes,” he says. Passopisciaro 2014 Contrada R Nerello Mascalese (Terre Siciliane); $90, 97 points. Aromas of strawberry, Mediterranean brush, blue flower, eucalyptus and a hint of new leather carry over to the radiant, elegantly structured palate along with red cherry and licorice. It’s gorgeous, vibrant and almost ethereal, with weightless finesse and ultrafine tannins. Drink through 2026. T. Edward Wines Ltd.
Tornatore 2015 Pietra­rizzo Rosso (Etna); $50, 95 points. Red berry, crushed violet, dried herb and dark spice aromas take center stage along with whiffs of balsamic and menthol. The elegantly structured, juicy palate delivers crushed raspberry, ripe Marasca cherry, licorice and white pepper alongside smooth, polished tannins. A mineral note energizes the finish. LUX Wines. Editors’ Choice. Planeta 2016 Bianco (Etna); $27, 92 points. Radiant and refined, this white opens on aromas of Spanish broom, white flowers and Mediterranean brush. It’s savory and racy, offering apple, pear and orange flavors alongside bright acidity. A salty mineral note lingers on the finish. Palm Bay International.